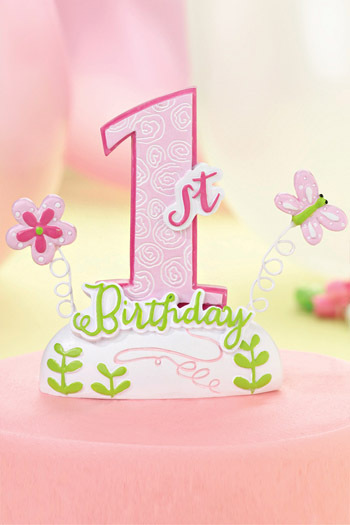 This adorable first birthday cake topper will add the finishing touches to your little girls birthday cake featuring a large pink number one. Each painted resin cake top measures 3.5 inches by 4.5 inches and features a large pink number one with the word birthday in green accented by flowers and butterflies. So glad I ordered this. ItÃ¢â‚¬â„¢s the perfect item to complete my daughters cake.